An Emirati Visual Artist and Anthropologist who graduated from Zayed University. She currently works as a graphic designer at Ras Al Khaimah Tourism. 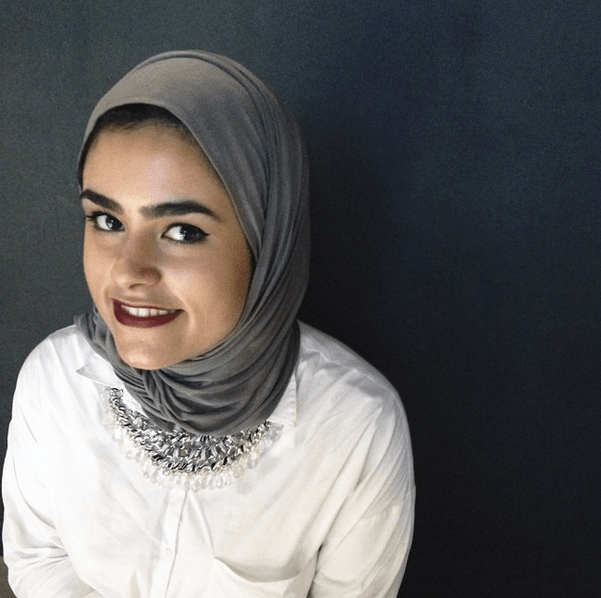 Ameena is passionate about the social and historical aspects of art and design within different cultures and societies. She is always keen on finding the link between art and design with the humanities and social studies. A graduate from the American University of Sharjah with a Bachelors in Interior Design. She currently works as an interior designer in the government of Sharjah, Department of Public Works. With an interest in architecture and design, she loves to visit design events and experience international masterpieces in this field. She experiments with painting her experiences in her free time. An Italian student at Ca’Foscari University, Venice. She is currently doing her masters degree in Languages and Financial and Legal Institutions of Mediterranean Africa. The arsenal of Venice is a very large part of the city of Venice and was the heart of the Venetian naval industry from the twelfth century. It is linked to the most flourishing period of the life of the Serenissima: thanks to the impressive ships built here, Venice was able to counteract the Turks in the Aegean Sea and conquer the northern European routes. The term arsenal, used modern Italian, derives from dar-as-sina’ah, meaning “house of industry”. 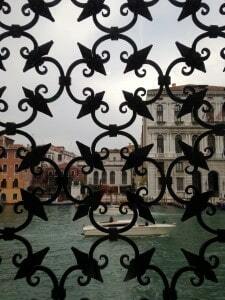 Thus was born the first link between Venice and the Middle East, between the Arsenale and the Arab world. So here we are: after traveling down the long corridor that separates the entrance of the arsenal exhibition halls, we find ourselves faced with Sale d’armi (literally weapons’ locations). The last one on the left houses the UAE Pavilion. We make three small steps and to our right we have a welcoming reception. Not only is it one of the few pavilions to have a reception, but it has also dozens of books, press releases and free catalogs for the interested public.The book that attracts the most attention of all is of “Last we forget”, a book that first was a simple project by Zayed University students under the direction of Michele Bambling and Susan Meiselas. 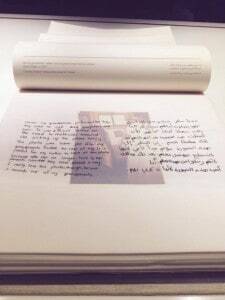 The project was then published for the Biennale occasion, and it turned to be practical and extremely useful, thanks to personal photos contained in this. It reports and summarizes indeed decades of history of the United Arab Emirates. 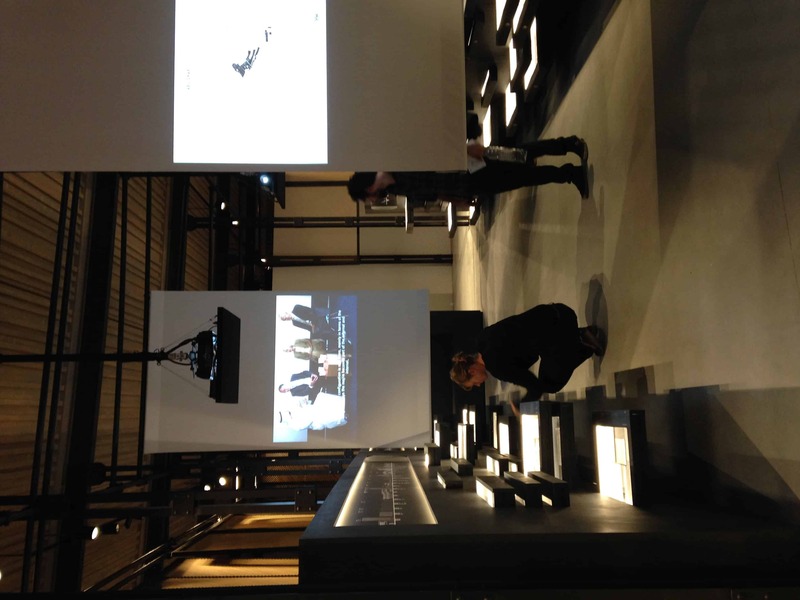 In front of the reception there is a bench, where I have seen people getting relaxed, lying down, or standing to take pictures.The bench is black, the reception white: here begins the contrast between black and white that will characterize the whole exhibition. On the top of our heads lies a pergola woven in Arish style (the thread of hemp once used by Bedouins for their curtains in the desert). It has been an extraordinary surprise to see that those big panels could move and create a unique visual effect, like if the wind is moving the Arish material. The drawers are black, the lights are neon-white: if you want more light just open a drawer. An intellectual light, because every drawer tells a story, shows something different, and maybe something you have never seen in your life.This is a multimedia exhibition that involves three out of five senses:Sight, touch, hearing: we can touch and flip through album, see pictures inside, observe the timeline, wear headphones and watch the video footage of the mini-player, we can sit and attend two lectures on the UAE architecture held by Professors of architecture, touch real models of architectural projects, and much more. Ancient pictures remind us of a hard past, the passage of the Emirate economy from pearls to oil, the first buildings in Abu Dhabi, Dubai and Sharjah, the first activities in the country,a past that was characterized by the British colonization, and then by the efforts of all Sheikhs united to create an important commercial center, that now is one of the most stable and secure countries in the Arab world. 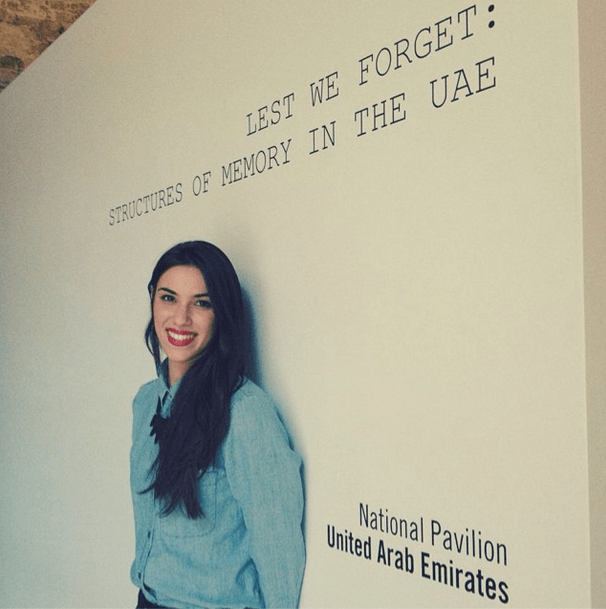 The pavilion has the feature to be accessible to everyone, adults and children, architects, starters and other professionals.There is no limit for those who want to know the history of the UAE architecture, and no limits for those who want to remember this history itself. Lots of visitors came to tell us that it is a very nice pavilion, they enjoyed everything in it and I have been always glad to thank them for the compliment and for coming too. As my internship is almost finished, I wanted to say few words: Saying that this month’s work for me has flown, it is perhaps not enough; saying that I had one of the most beautiful cultural exchanges in my life, probably is not enough; saying that I am deeply proud of this experience could make you the idea. But not all. Everybody should try a month of this kind, in a pavilion that will steal your heart and with some co-workers that you love already after a few days. You would not have the words to describe it. A journey that has enriched me not only of architectural knowledge, but that has tested my Arabic, expanded my open mindedness, the desire to investigate the Arab culture and definitely increased my desire to go the UAE someday, to see with my own eyes the buildings with which I come into contact every day in the form of paper documents or video. I am extremely grateful to Salama bint Hamdan Al Nahyan Foundation, the United Arab Emirates Ministry of Culture, Youth & Community Development, to Musbah, to Mouna, to the whole team of The National and who was behind this great work, without forgetting my teacher of Arabic language Massimo Khairallah, for allowing me to live this wonderful experience. The exhibition “Lest We Forget. Structures of Memory in the UAE” is a clear response to the theme of the 2014 La Biennale di Venezia proposed by Rem Koolhaas: “Absorbing Modernity 1914-2014.” It is an opportunity for a thorough analysis of architectural and urban development in one of the youngest Countries in the world, but also a scenery of some of its most emblematic buildings. 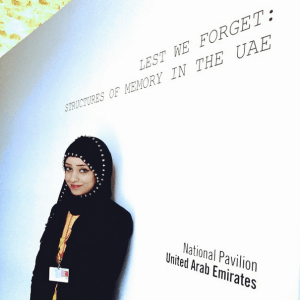 The Pavilion of the United Arab Emirates – that I would like to affectionately call Our Pavilion – therefore proposes four major historical periods: 1914-49 Vernacular Architecture, Infrastructure and Urban Development 1950-70, 1971-94 Structures of Modernity, 1995-2014 Retrospection and Innovation. The fulcrum of the research are the 70s and 80s of the last century, in view of the fact that the independence of the UAE from Great Britain is dated December 1971. I could describe the wonderful installation in several ways, through numerous comparisons, highlighting its many and labyrinthine facets. The way that comes most natural is to use some adjectives, adjectives that I attach personally to this masterpiece.Not being a student of architecture, you may think that I will never fully understand the great enthusiasm that gave birth to this project, the technical drafts, calculations, measurements, costs and efforts it brings with it: it may be true, actually.But the Pavilion of the United Arab Emirates does not discriminate against anyone, it is welcoming and helpful: it lets you read itself like an open book, as the first item I cherished the very first day of work: a big book elegantly bound, full of photos and comments. Isn’t this wonderful? Through these photos, everyone – absolutely everyone – can join the project and sneak silently into the lives of those who have given life and form to it. The Pavilion is also smart and straightforward, you can recognize it in a simple manner through all of its complexity: Feelings, feelings that these photos bring with them. The reflection on modernity, presented for the first time here in Venice, is immediately recognized with a rigorous and elegant installation. Black is the dominant color and provides an effective visual impact of the seriousness and professionalism: without yet being able to take a look at the project itself, it quickly becomes clear the commitment and perseverance of a growing country, always in transformation, that is not afraid of change and is willing to accept the challenge of modernity with its head high, chest out and stomach in. Under a pergola woven with the thread of hemp once used by Bedouins for their curtains in the desert, the exhibition was developed along two walls facing each other, a summary of the history of the UAE from 1914 to 2014 and, in parallel, the other countries of the world: it is thus very evident graphically the creative and economic surge of the Emirates in the last hundred years and their amazing contribution to the history of architecture.It shows very well the development in the UAE with that of the rest of the world – an explosion of architecture all to open, browse, touch, and imagine. 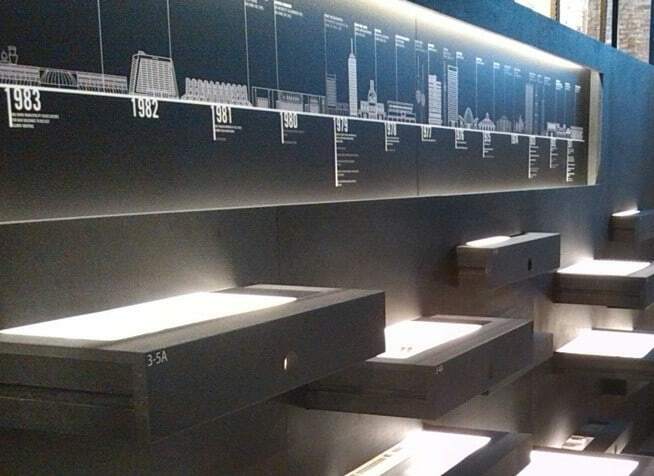 Under the timeline, the curator has made ​​many drawers that visitors can open at their leisure to discover samples of materials, vintage photos, documents, national history, and even a “relic” curious flask containing the first oil extracted in Dubai; models, drawings, photographs, and oral histories complete the picture.At the helm of the exhibition are the architectural buildings – not the architects – and this is a very important thing: all energies are channeled to fully understand what is contained in those drawers. During this month, I experienced the Pavilion as an every-day-housewarming party and I got the impression that for many people it was the same. Several times I have had the pleasure to witness visitors sitting in the Pavilion after visiting the exhibition, while others stayed hours scribbling sketches of an inexplicable bizarre dream. I could see that not all visitors who go to the Biennale do it with the same spirit: some, the most passionate,mostly adults,grab everything they see and observe EVERY SINGLE piece of the exhibition with their eyes glittering a sense of satisfaction. Others are attracted by technology, so much that they try to get selfie with our media player (ahh, youth!) and they turn away embarrassed when they are kindly asked not to touch the screen – they would be ashamed for a whilebefore laughing and leaving: they know – in their hearts – they still have to face so many editions of the Biennale before they can truly understand the wonders contained in it;then there are also mini-visitors, kids! Whether exploding volcanoes, quiet butterflies dressed in pink or quarrelsome brothers ready to raze the hall, they feel the inside of the playground and want to know everything that surrounds them. The parents apologize for their sticky little hands on the drawers, and for them instead the pavilion United Arab Emirates is a Pandora’s Box that they do not see to uncover the time, a gingerbread house without evil witches inside. I think Our Pavilion has been appreciated by anyone who has had a question and has given many the opportunity to find the answer. I think the strength of the structure, its way of being so orderly, so geometric (if I may say so) has transmitted to visitors the calmness and confidence you need to walk in the United Arab Emirates with the assurance to be part of it even if only for half an hour. I think this is a complex project but full of immediacy, and I am sure that all those who have asked me with excitement and happiness for the exhibition catalogue or the link to download the timelines think the same thing. We have collected great compliments and this could not have happened by chance. It was a pleasure to work here. I feel a little bit sad now, but I hope I would be able to tell everyone how great and powerful Our Pavilion is. No one ever thought that Palazzo Venier dei Leoni, originally envisioned as an ornate, five-story palazzo situated along Venice’s Grand Canal, would house an art collection as elite as the Guggenheim one day. Originally designed by Lorenzo Boschetti, building began in the 1750s and was never completed. 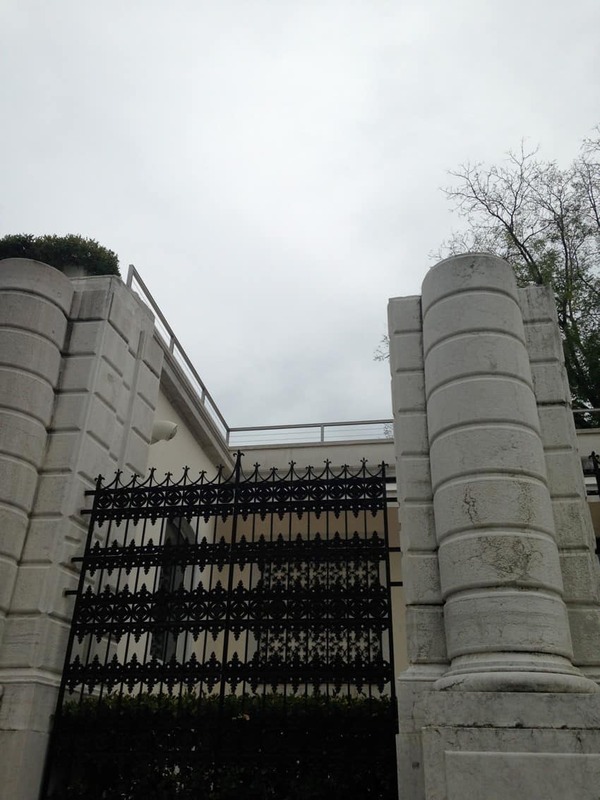 As a result, the building gets a new nickname Il Palazzo Non-finito that translates to “the Unfinished Palace.” In 1948, Peggy Guggenheim, niece of Solomon and widely recognized as one of the most influential art patrons of the 20th century, purchased the building as her home, where she also installed her private art collection. Peggy bought art, not as an investment, but because she saw greatness beyond these pieces. 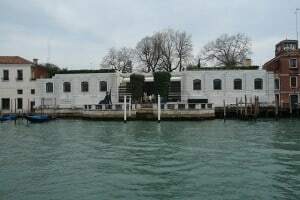 As a result, in 1969, she decided to donate her entire collection and the palazzo, to the Solomon R. Guggenheim Foundation, and that is what we see today in Venice. 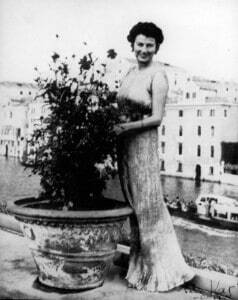 Peggy Guggenheim was born in 1898 to a wealthy family in New York City. After basic education on subjects of modern art in the 1920s, she went on travelling to Europe, discovering Paris along the way where she stayed for almost 22 years. As the whole of Europe suffered from the tremendous casualties of the Second World War, Peggy Guggenheim set out on her tremendous cultural crusade. She boldly decided to “buy a picture a day,” which resulted in owning surrealist works by Dali, cubist works by Braque and Picasso and geometric designs by Mondrian and Fernand Léger. Later on in 1948 and after discovering Venice, her collection was exhibited at the Venice Biennale, which was the first time that Pollock, Rothko and Arshile Gorky have been introduced to Europe. The exhibited collection was a clear combination of pre-war pieces and contemporary unknown artists, and had a controversial characteristic to it, different than any other art exhibition displayed in the West. Starting the year 1951, Peggy opened her house and collection to the general public every summer and by the spring of 1985, all of the rooms on the main floor have been converted into galleries and the basement rooms into support areas for the museum. In 1993, apartments adjacent to the museum were converted to galleries, a garden annex, and a shop designed by Lella Vignelli of Vignelli Associates, New York, which shows the importance of the museum and its influence on its surroundings. Since then, the museum has doubled in size, from 2,000 to 4,000 square meters with the addition of a café, extra exhibition rooms, and the Nasher Sculpture Garden. In contrast, Palazzo Venier dei Leoni’s rectilinear plan and clearly divided spaces worked successfully in terms of exhibiting art works. 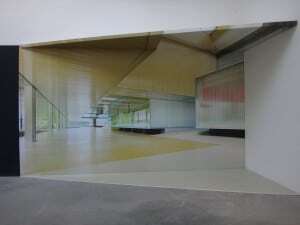 As visitors first enter Peggy’s former house, they are greeted by a foyer that is large enough to host a sculpture. Windows that overlook the Grand Canal flank the foyer and visitors can also cross the space and move into the house’s backyard, which has the main canal entrance. 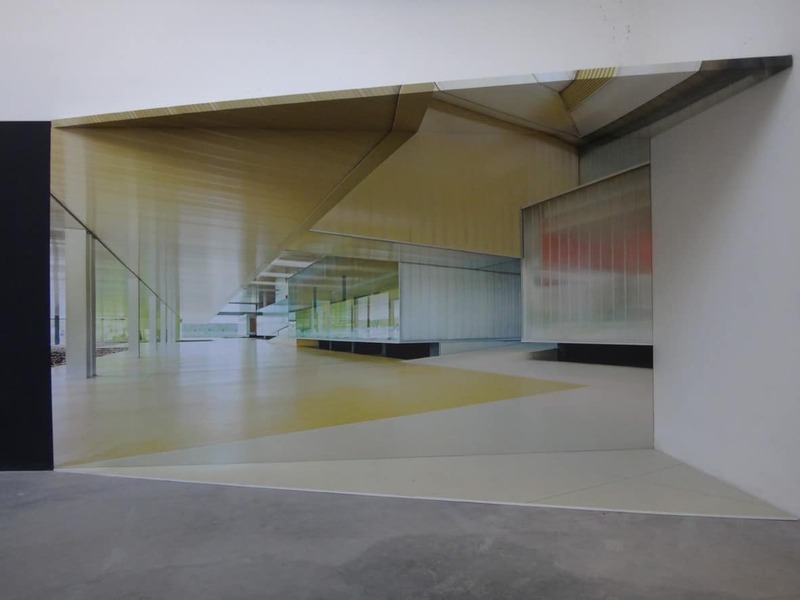 The central space then breaks into hallways that are of sufficient width for circulation and create an intimate relationship with the artwork and the regular visitor. In contrast, the large pre-existing rooms in the house create another relationship with the visitors, where some have seating in the center to accommodate the overwhelmed visitors. 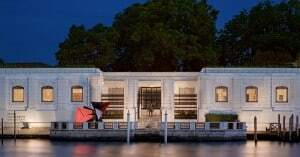 They are filled with natural light and beautiful views of the Grand Canal, unlike any other museum in the world. Opposite to the original house lies the building for the temporary exhibitions. 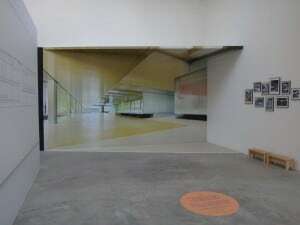 The spaces have a simpler circulation path, where visitors enter from one space and the hallways lead them to all of the exhibition rooms and finally to the exit. 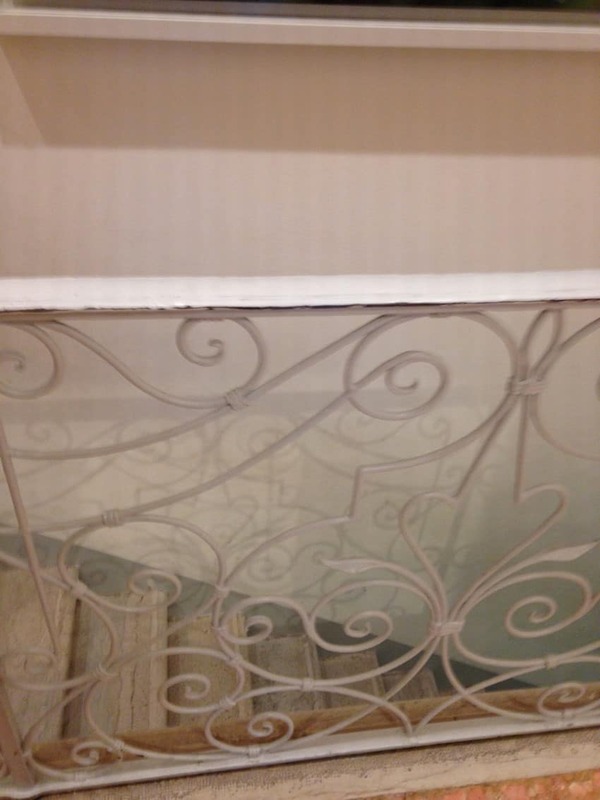 Both buildings have a similar architectural language that carries out through the exterior and interior, such as the window-covering pattern and railing for the stairs. Also, the distinct patterned terrazzo floors, that are repeated, remind the visitors of the fact that the exhibition spaces were once a home. 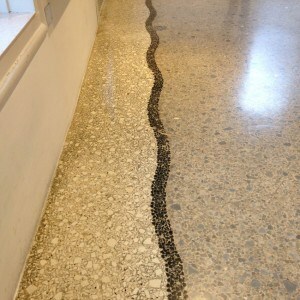 These elements connect the separate buildings and tie them back to the same intention, of creating coherent spaces to primarily exhibit unique pieces of art. 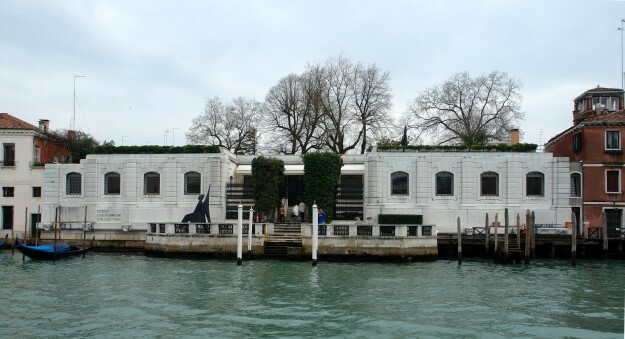 However, it is important to note that because the Peggy Guggenheim museum was a house to begin with, it is completely closed off from the general public that pass by the building. 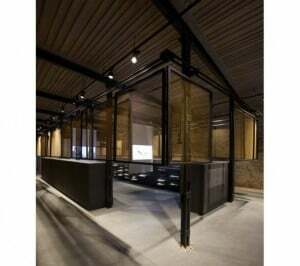 The museum has the aspect of privacy and the crossing of thresholds to get to the center of the house or in today’s case, the exhibition spaces. Therefore, no one can actually guess that it is a grand museum except by reading the sign on the building. 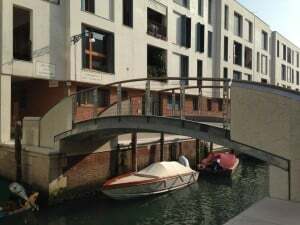 In my opinion, this case can only seem fitting in a city like Venice, where most of the buildings on the forefront of the canal speak the same architectural language. My personal favorite space in the Peggy Guggenheim was not a specific room but the sculpture garden. Because gardens are very rare in Venice, experiencing one amidst two great art exhibition spaces gave it an astonishing feel. With its minimal seating spaces and extra tall trees, a feeling of tranquility washes over you all while being surrounded by fine sculptures. Ironically, Peggy’s ashes are buried in a corner of the Palazzo’s garden after dying in 1979, along with her 14 dogs. 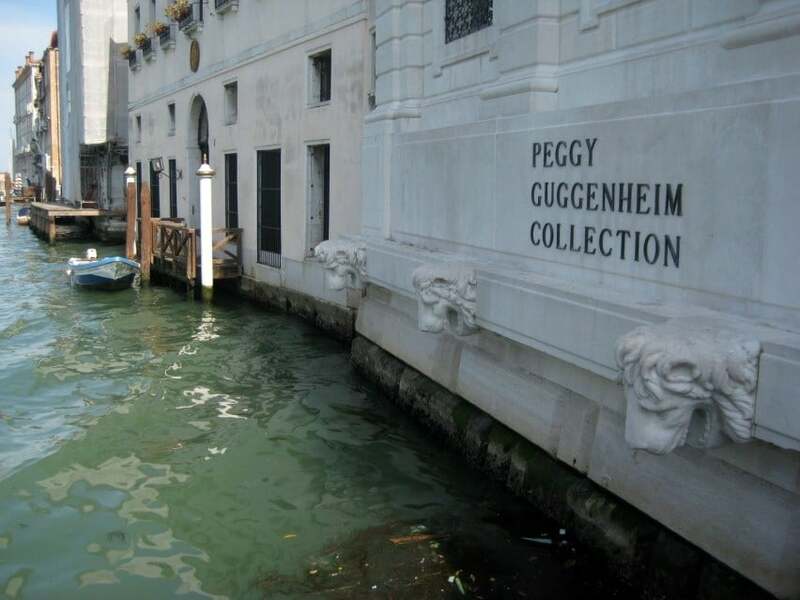 Because she was an art collector who believed that some works are worth keeping safe, she gave us a gift that can never be dismissed, which is the Peggy Guggenheim museum. 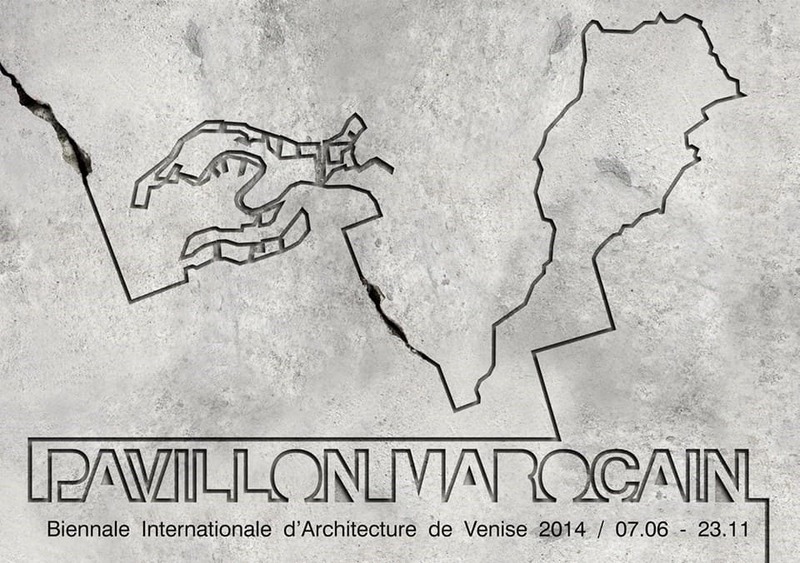 Morocco’s first ever pavilion at the 14th Biennale di Venezia bases its concept upon Morocco’s role as an urban and architectural laboratory over the last century, describing itself as a territory of exploration with an extraordinary potential – a veritable workshop for the Modern Project. The curator of the Moroccan pavilion is Tarik Oualalou, an architect with a degree from Harvard University who is as well president of the FADA Foundation (Foundation for Arts, Design and Architecture). He called the exhibition “Fundamental(ism)s”, a title that offers an allusion to the general theme proposed by Rem Koolhaas for his Biennale “Fundamentals 1914-2014”. Koolhaas, the Biennale curator, wanted participants to focus and consider the past in exploring where architecture is at now and where it could be headed in the future.That is exactly what Morocco’s pavilion did. We enter the Moroccan pavilion with our heads held high, colored lights and warm colors all around. A single step and a magical feeling envelop us: Sahara desert is under our feet. This is the first winning choice for this project: take a step and you’re instantly Jasmine. While walking to the installation you cannot help but think of buildings from the Arabian Nights, golden domes, huge gardens, beautiful fountains and in the end, the boundless desert – hot but wonderful – with that fine sand that slips through your hands. The word “desert” derives from the Latin desertum, composed of the particle “de” that assigns a negative sense to the verb serere that means to connect, to tie, stating an entity that doesn’t have a connection point, empty, uninhabited. Morocco and the desert are linked together by an indissoluble bond; the desert has always been considered – wrongly – a place without life, where everything dies and nothing grows. It gives full life to Morocco instead, that breath in deeply through the small desert’s beads: the magnificent Moroccan cities, such as Casablanca, Fez, Agadir and Boulemane. The sand dunes triangular forms are characterized by strength and stability and have a relationship to the desert’s power, which performs a unique function. It is a monument to the sky and to the sun, evocation of the passing of the seasons and time. 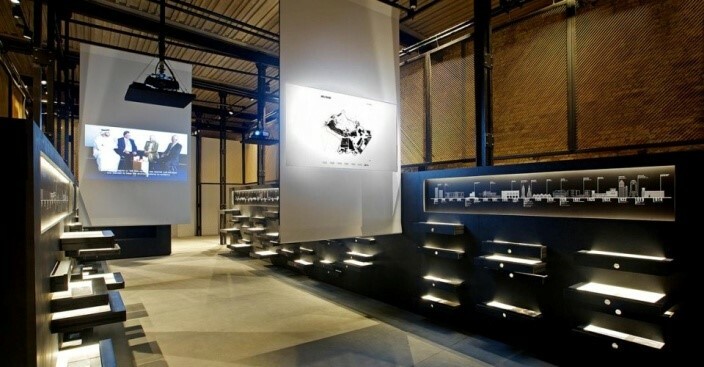 The installation shows a strong vision of a country that has absorbed and metabolized modernity and radicalism, integrating them in the territory; this is, too, something to which Morocco has always been accustomed to: the tradition always tries to find a meeting point between modernity and radicalism, but also appropriation and integration. 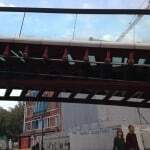 The pavilion is divided into two parts. 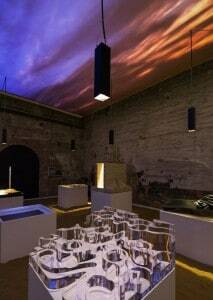 The first part is composed of a historical exploration exhibiting ten projects (one per decade) in which a traditional city is presented. The ten selected projects explain how the idea of “medina” is central in the Moroccan architectural design research and how it served as the origin of many radical architectural and urban projects throughout the century. It starts with the Medina of Fez, which was founded in the eighth century to move to the district Habous in Casablanca (1917), or the block Assayag built from 1930 onwards in the same city. 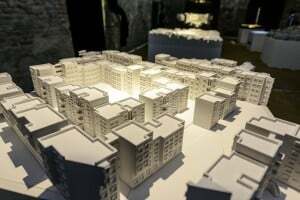 Then, there are also models of buildings from Nid d’Abeille and Sémiramis, an experience guiding submitted by architects ATBAT-Afrique 9th CIAM (International Congress of’ Modern Architecture) in 1953, in Aix-en-Provence. 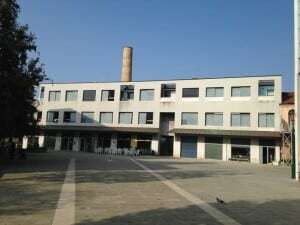 The complex became an example of adaptation of modern architecture in search of new inspiration. Not only buildings and structures, but also public spaces like the Great Square of Agadir are reproduced in that magnificent exhibition: the city was destroyed by the earthquake of 1960, and has become a place of heroic architectural expression of a country that has recently gained its independence. You can also find a video installation, projected onto the ceiling of Fulldawa Films, directed by Ismaël el Iraki and Benjamin Rufi, filmmaker born in Morocco but active in France. 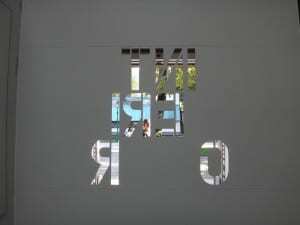 The film consists of a contrast between day and night images. During the night, the starry sky of the Moroccan desert dominates the viewer, immersing it in an intimate atmosphere, conducive to the discovery of the projects, individually lit.The sun begins to rise on the first site, which is also the oldest (the Medina of Fez), while the remaining sites are presented in chronological order. At sunset, dipping to the pavilion in different atmospheres during the movie, we return again to the silent night of the Sahara. The second part of the exhibition focuses on territorial speculations in the Western Sahara.The Sahara is still considered unspoiled and unexplored maybe because of its special geographical and climatic conditions, which make it very difficult to make projects of architecture. Islamic culture has influenced literature, art and architecture – in particular Western architecture – involving figures such as Gaudí, Wright and Le Corbusier. The coldness and self-modernist canons contrast with the attention to the environmental context, the spiritual component and the fundamental social purpose of Islamic architecture.The unique geography of the Western Sahara and its position as a territory at the ‘limits,’ in a climactic, social, and political sense, demands that architects question how to integrate architectural and infrastructural solutions into such marginalized territory. They have to get used to a kind of artificial landscape, supported by structural elements which also function as shielding systems, which is, however, highly integrated in the landscape. The research project explores, in fact, not only an extreme environmental condition for the development of urban bodies and living spaces, but informs through the use of new and innovative methods to increase the architectural production that could be constituted as an autonomous element, even in the desert landscape. Projects are presented on the stems emerging from the sand, leading to a slowing down to a stop with respect to the general frenzy of the Exposure: a reversal of the relation of the senses favored by the scenery inspired by the Sahara. The visitor is invited to experience the experience of this legendary desert and of its immense horizontal dimension where the sky is also a map, a navigation tool to the stars. Everything is inspired by the Sahara inside the Moroccan Pavilion! The celebration of art and architecture in Venice is exceptional because it does not only embrace each detail within the space; it also combines the perfect atmosphere and the feeling of appreciation for art and architecture. Creating such a flourished artistic atmosphere requires efforts of groups and individuals who play significant role, both historically and artistically. Great effort comes from great love and passion towards the love of what we do. 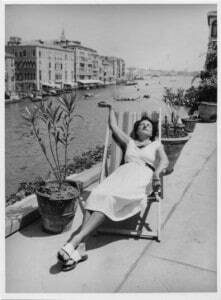 In the same way, those like the lady Peggy Guggenheim who love art and architecture, can impact us deeply. Known for her revolutionary parties and outrageous behavior, the wealthy libertine became one of the most outstanding personalities of modern art as she liberated many minds and souls about modern art. After the tragic death of her father, a large part of her Peggy’s fortune went towards satisfying her passion for collecting contemporary art. She eventually settled in Venice in the Palazzo Venier dei Leoni, where she created a “museum- home” for her collection. The 18th century palace, Venier dei Leoni, on Venice’s Grand Canal became her home in 1947. There are several works displayed inside the Palazzo Venier dei Leoni by Pablo Picasso, including the cubist, and The Poet. Other art colelctions in the palazzo include Marcel Duchamp’s Sad Young Man in a Train, Juan Gris’s Bottle of Rum, Max Ernst ‘s The Attirement of the Bride, and many more masterpieces of the first half of the 20th century. The Palazzo Venier dei Leoni is a modest building by Venetian standards. The design, shows a mélange of “neopalladianism” and baroque forms of engravings which was done by Giorgio Fossati. 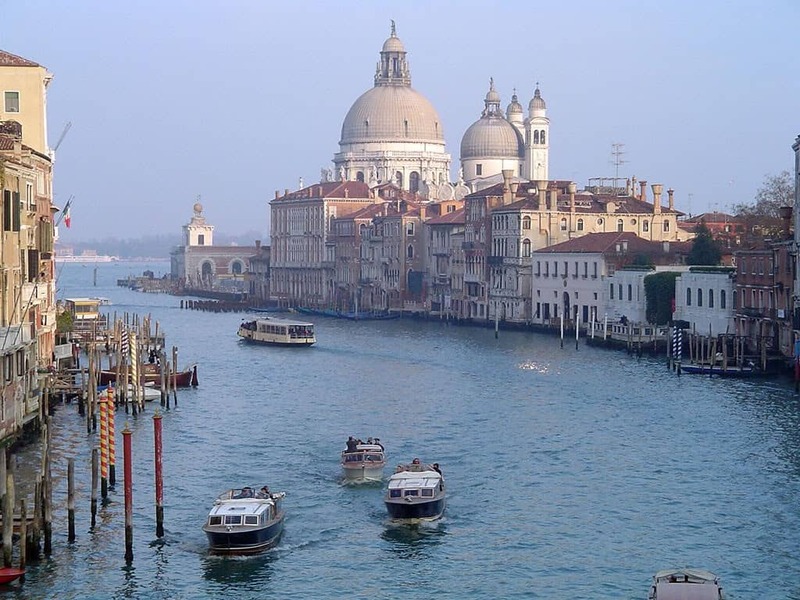 To get to the Guggenheim, you can take a vaporetto, which takes you along the length of the Grand Canal. 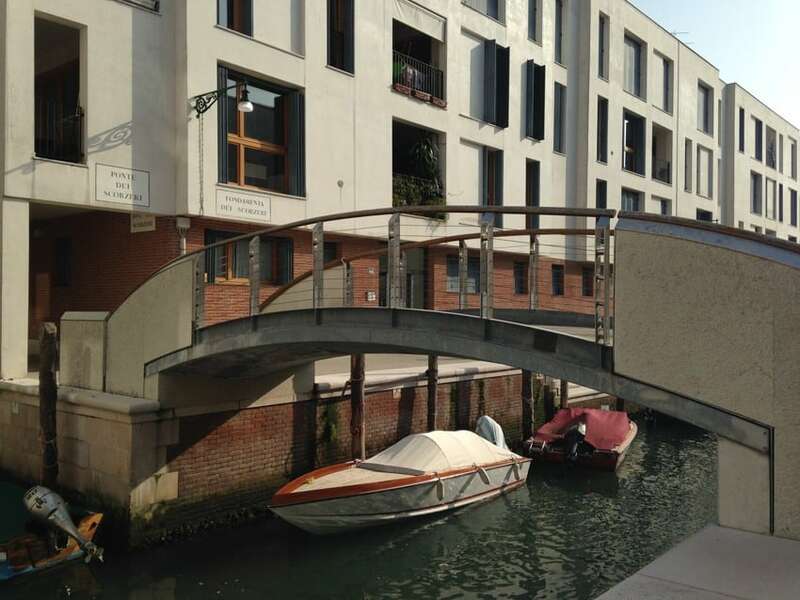 Like most destinations in Venice, there is no access from the pontoon in front of the building where you alight. You have to find your way around to the entrance at the back, down the alley, which seems to be designed to mislead the viewer into seeing more of Venice. But the Guggenheim is not difficult to find, and as I arrived at the Palazzo Venier dei Leoni, the sun had brighten the great architecture into the most beautiful form. The overall structure of the palace consists of an entrance from the Canal Grande, a hall of four columns near the land portal with two staircases, and an oval courtyard, which gives it a simple structure to a multilayered function in the different collections. From the outside, it has a long low façade, made of a stone called Istrian, which is set off against the trees in the garden. What was more interesting to know about the history was the secret behind the naming “Palazzo Venier dei Leoni” which some suggested was derived from Lions that the Venier supposedly had held in the garden. It is also known as the “Maifinio”, which means “never finished” in the Venetian dialect. The Palazzo Venier dei Leoni, was intended to be a three level building. 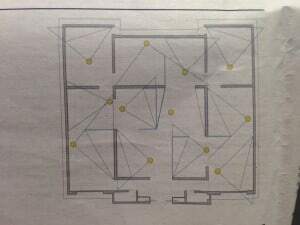 Only a small portion of the first floor was completed. The reason why the building was never finished remains a mystery. Some suggested that there was battle between two prominent Venetian families, the Veniers and the Corners, adding to the economic issues led to the incompleteness. 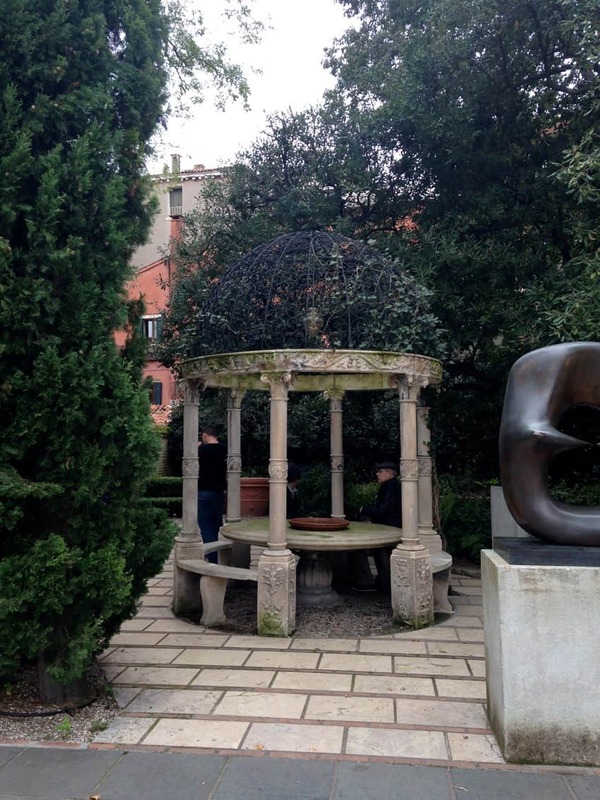 In 1947, Peggy Guggenheim acquired the palace fragmentation. The Guggenheim collection comprises the sculpture garden in the back, the interior rooms and hallways of the palazzo, and the terrace sculpture garden beside the Grand Canal. 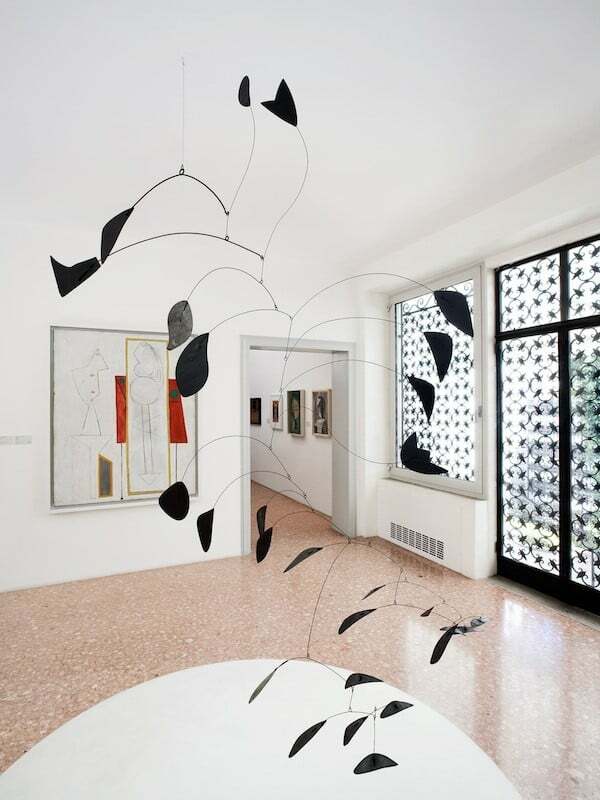 Among the recognizable and often reproduced pieces from the Peggy Guggenheim Collection are Brancusi’s two sleek avian sculptures, Maiastra and Bird in Space and Jean Arp’s Overturned Blue Shoe (1925). After being overwhelmed by the masterpieces, I was pulled into another fascinating collection, which is the library. In the Library, as I walked through the tiled terrazzo and patterned rug, I immediately recognized a familiar Picasso self-portrait, specifically a half-Length Portrait of a Man (1939), that is hanged in a corridor beside works by Braque. The flow of the artistic surroundings does not stop there, as the visitor continues to the former guest-room with Pollock’s half a dozen artworks. The artistic representation changes within one architecture, yet it perfectly fits the whole structure because it simply does not disturb the atmosphere. The next collection was the Large Room with a magnificent surrealist theme. The room is basically dominated by Ernst’s two artworks: the red-feathered Attirement of the Bride, and The Antipope, with its predatory, horse-headed representation of Peggy. In the same room are also some lovely Magrittes and Dali’s Birth of Liquid Desires (1931-1932). The collection sets a visual timeline within different approaches of art. The most interesting artworks are showcased within a small room that displayed paintings by Peggy’s daughter, Pegeen, and a collection of miniature blue-glass sculptures by Costantini (1964) after sketches by Picasso. As a person walks around the architecture, he or she come to the conclusion that the Palazzo Venier dei Leoni is one of the most important repositories of historical art in Italy; this imposing edifice holds paintings and altarpieces by the great artists through the centuries as it is a modern gem. It also made me think of houses as the most impressive sub-set of any artistic collection because it takes the visitor into an intimate experience within a large collection of modern art. The Peggy Guggenheim Collection is substantial in art terms, but not so intense in number and scale that the viewer is confused. 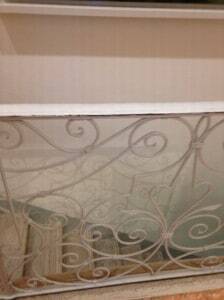 Like other visitors, I leave the interior rooms and take time out to digest what we had seen before. Peggy Guggenheim was able to amass her formidable collection of cubist, futurist, surrealist, metaphysical and European and American abstract expressionist works. Whenever Venice, the city, is brought up in a conversation, all one could think of is its unique architecture. A floating city entirely built on a wooden foundation is a constant mesmerizing factor. Its individuality is a feature that cannot be dismissed. Typical Venetian houses flank the lagoon and Grand Canal with a very specific architectural identity that gives the city its particular aesthetic. Made essentially out of brick or stone with layers of sand and mud, each house has a similar set of windows and a layer of paint that starts high above the ground level as well as a few doors directly on the water passages. 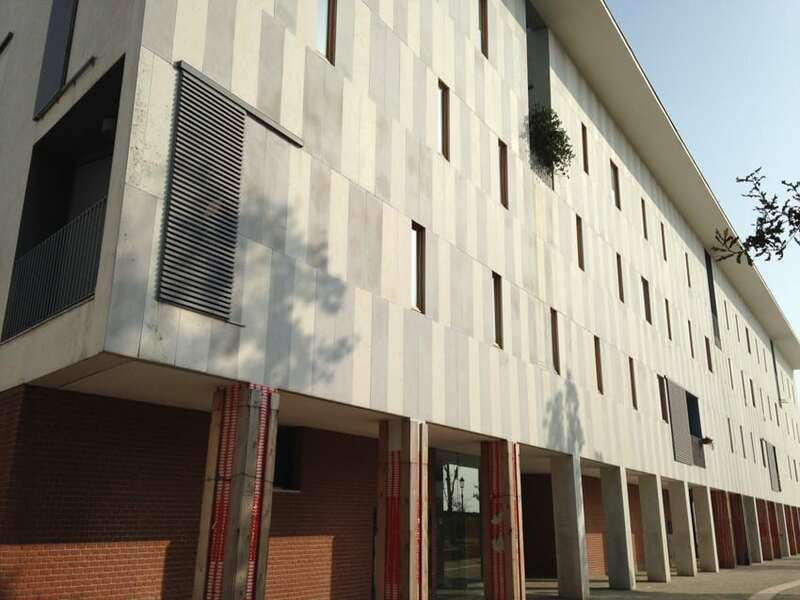 But there is more to this fascinating city, hidden gems of modern and contemporary architecture that can only be found by keen seekers, such as the Junghans Theater, several residential buildings in Giudecca and the Constitution Bridge. The view of residential buildings at Guidecca’s entrance Hidden away from any direct contact with lightheaded tourists visiting Venice lies the Junghans Theater in Giudecca, totally separate from the Venetian mainland. 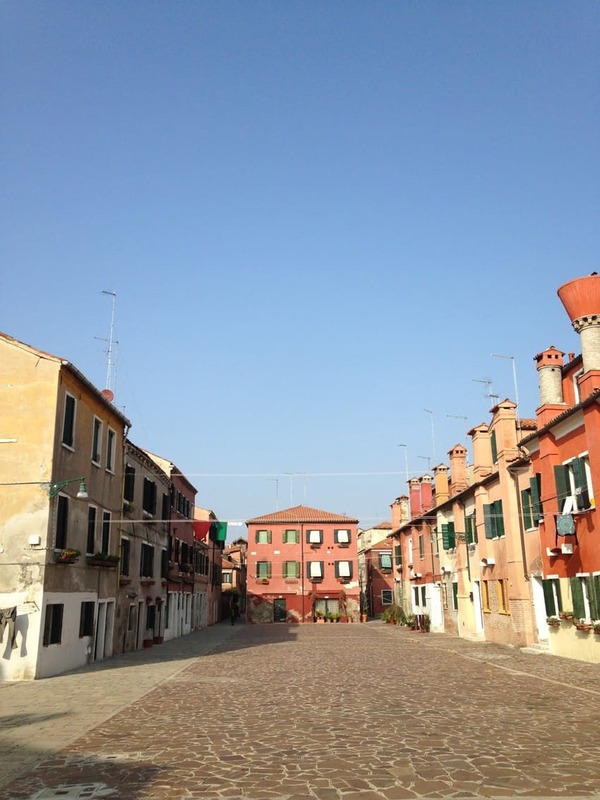 As you walk through the typical Venetian alleys flanked by the typical residential architecture and once you arrive in Giudecca, you suddenly face the southern side of this island, an area filled with contemporary architecture. Having a totally different language than the one before, visitors cross a threshold of a modern bridge that prepares them for what lies ahead. With curved exterior walls, glazed facades, extended steel beams and circular windows, the Junghans Theater definitely stands out in its environment. Originally opened in 2005, it is considered the latest addition to the collection of Venetian theaters and now houses the Academia Teatrale Veneta, the original school of theater studies. Large extended balconies wrap around the building, a feature rarely seen in typical Venetian architecture. 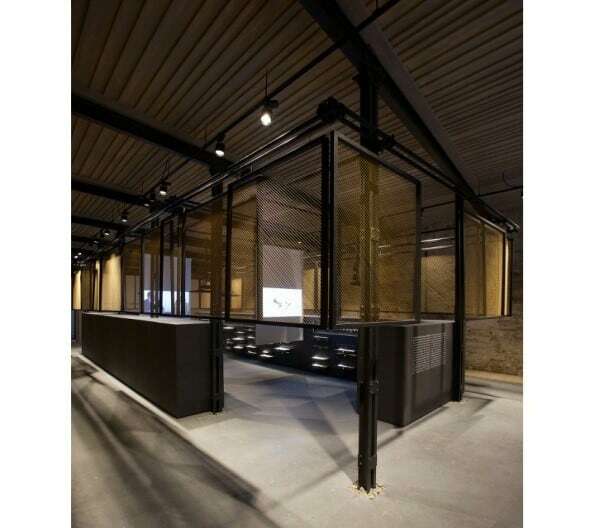 Fully glazed parts of the building allow a large amount of natural light to infiltrate the building as well as give an exterior-interior relationship. With asymmetrical elevations and steel beams creating canopies and railings for plantations, the architect’s clear intention was for it to stand out. 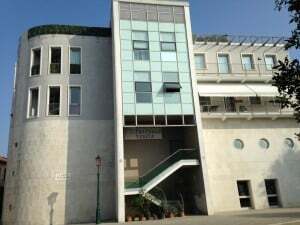 The only connection that it might have with the original Venetian architecture is that the façade is made out if stone, a weak attempt in connecting it to the basic architectural element of the island. Located in the same square or “campo” in true Italian fashion, many residential buildings continue the same contemporary aesthetic. 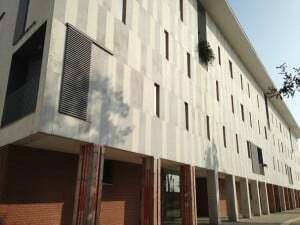 The key buildings that stood out were the G1-G2, E1, A2-A3 and D Residential buildings all designed by Cino Zucchi Architects (CZA). 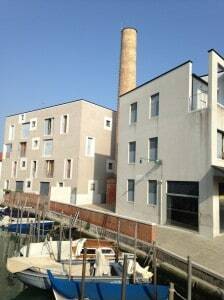 Due to having facades made out of the same materials, the G1-G2 and E1 residential buildings in Guidecca have the closest resemblance to Venetian architecture. Made out of exposed brick at the bottom and painted brick at the top, the E1 building continues an important aesthetic in Venetian homes. 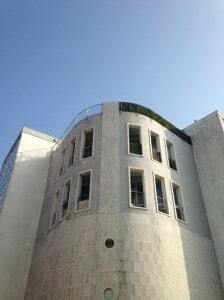 However, the G1-G2 building has it reversed, with the exposed brick being the upper part and the addition of glass boxes as entrances and curved punctures in the elevation, finished in concrete. Despite the windows varying in size and aligned asymmetrically, they still maintain the importance of the rectangular form found throughout the city of Venice. 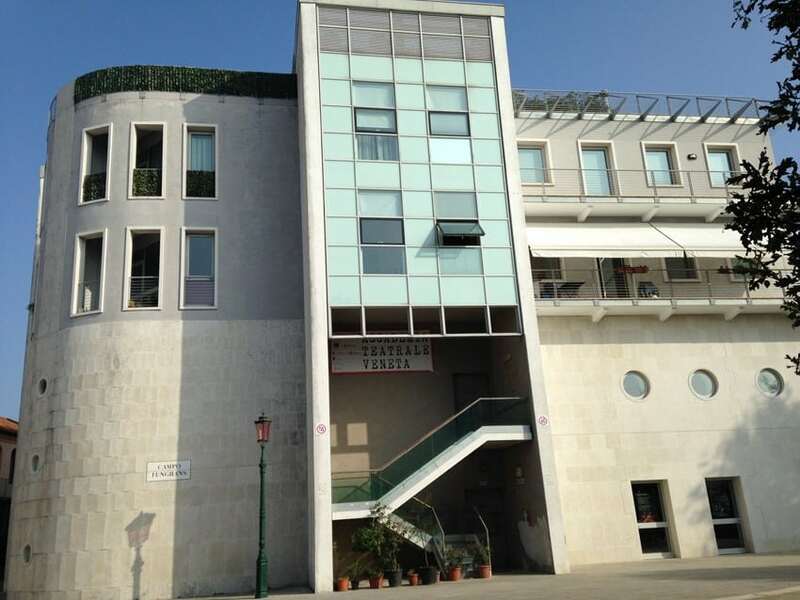 Both buildings have that distinct difference between the ground level and the rest of the building, a continuation of the “piano nobile” notion found in all Italian houses. 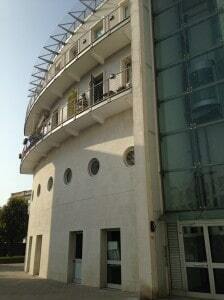 In contrast, the A2-A3 and D buildings are characterized with an unusual architectural style to the city of Venice. Slightly similar to the Junghans Theater, these two buildings cannot help but be noticeable amidst their surroundings. Although the architects decided to keep the main form of Venetian windows, their panels slide to the side rather than protrude and fold to the exterior or move vertically. 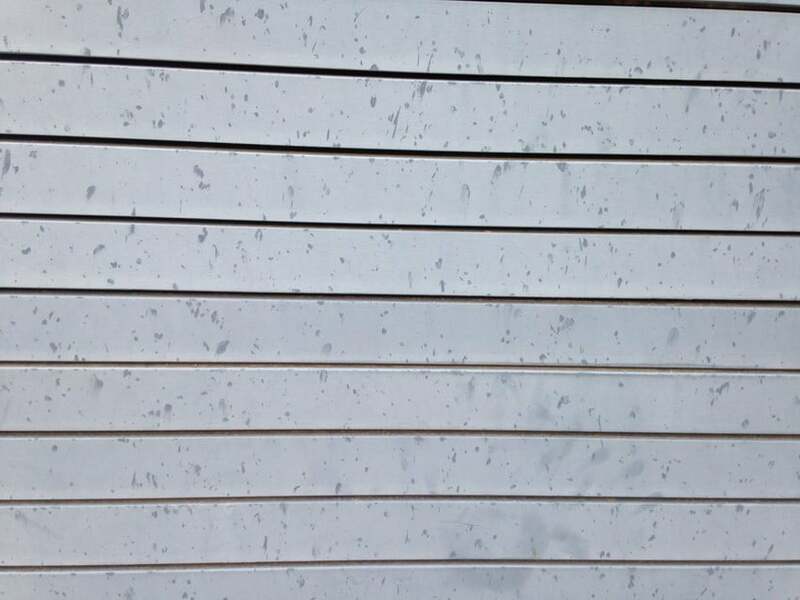 The finish of the facade is concrete with a certain highlight to the windows, either with a white paint border in the D residential building, or with the cladding on the windows in the E1-E2 building. 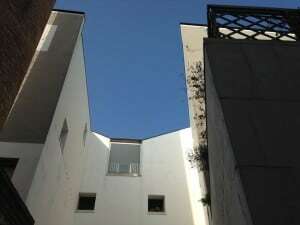 Other elements further alienate the building from its environment such as the introduction of a courtyard with a very distinct form in plan or frosted glass doors that lead to the interior. Also known as the “City of Bridges,” Venice is famous for its endless number of bridges, varying in all sizes and forms. 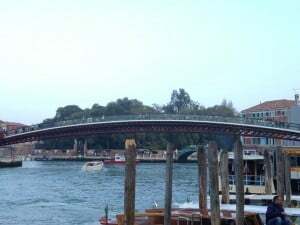 However, the bridge that stands out entirely is the Constitution Bridge or Ponte della Costituzione, which connects Piazzale Roma and Santa Lucia train station. Being the fourth pedestrian bridge to cross the Grand Canal, it is designed by the Spanish Architect Santiago Calatrava and was inaugurated in 2008. It is mostly made out of modern materials such as exposed and painted steel as the structural skeleton, frosted or tempered glass for the steps with the exception of the use of marble in certain zones, an attempt to create a relationship with original Venetian materials for bridges. Even though it takes after an alienating fluid form in contrast to its neighboring bridges, the architect has managed to come up with a design that makes the bridge sit in its surroundings gracefully. With its exposed bolts and structural mechanisms, the Constitution Bridge embodies the true meaning of contemporary architecture, closely relating function and aesthetic. Its sleek nature and minimalism makes it easy on the eyes in spite of choosing the color red for the steel skeleton. 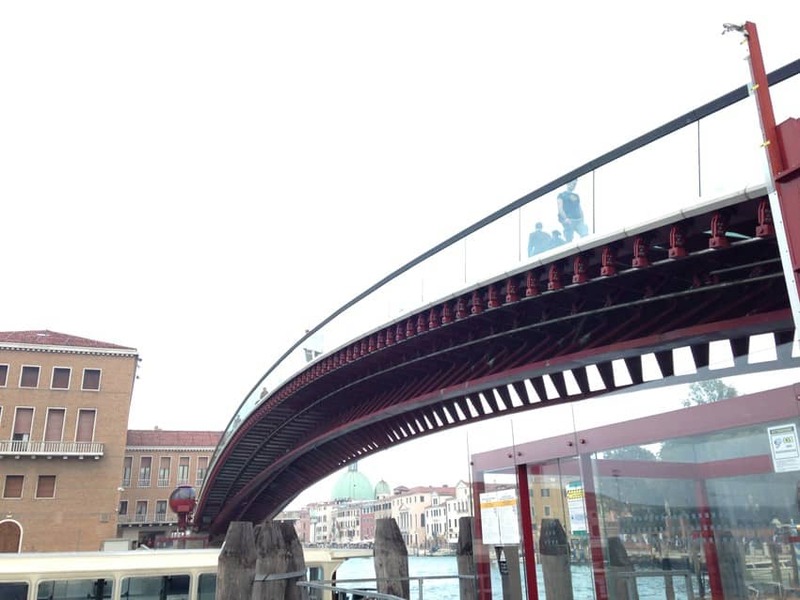 Despite it having a comfortable slope, many Venetians have slipped on this bridge’s steps due them being made out of glass, which might get slippery during the rainy season in the winter. 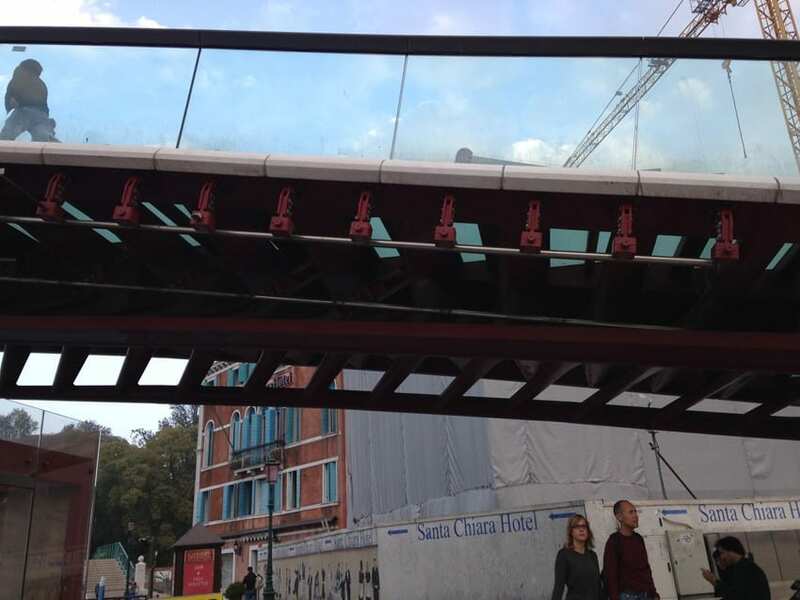 This caused certain uproar while installing it that lead to a delay in its completion, among other reasons such as its modern architectural style and difficulties in transporting the prefabricated parts and their installation. Almost everyone knows the typical Venetian architecture, either its common residential style or Gothic palaces in Piazza San Marco. However, your average tourist will not explore Venice far enough to come across its modern masterpieces of architecture, such as the Junghans theater, Guidecca’s residential buildings and the Constitution Bridge. Although the buildings discussed are entirely different from typical Venetian architecture, even in height, they don’t really disturb the harmony of the existing environment by standing higher than usual or by being painted in a distinct color. 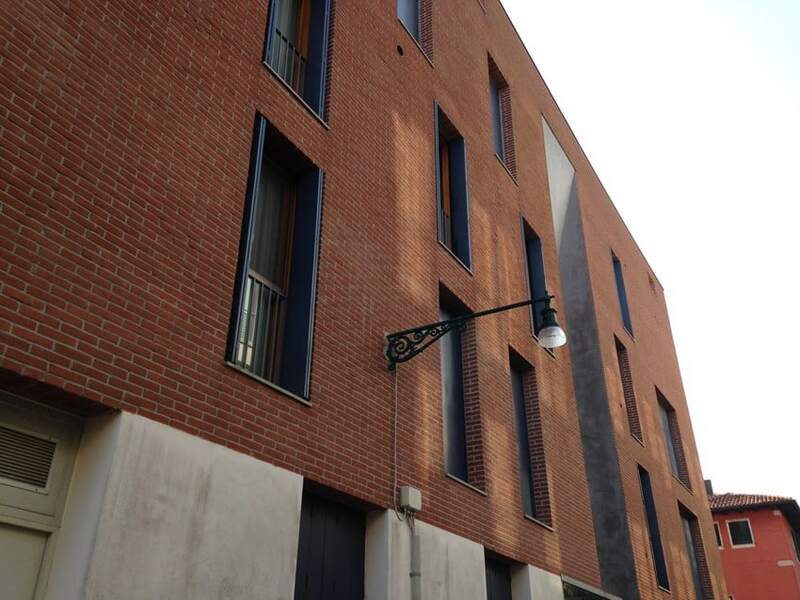 In certain cases, the classic alley lighting of Venice is installed on the modern buildings in Giudecca, attempting to relate these buildings to their surroundings. 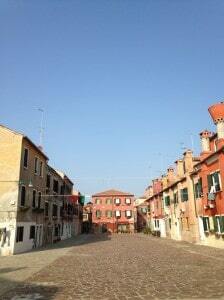 Even though they are aesthetically completely different, they are tucked away behind the real architecture in Venice. In a sense, it forces visitors and tenants, in its own way, to appreciate the existing architecture and not dismiss or diminish its value. 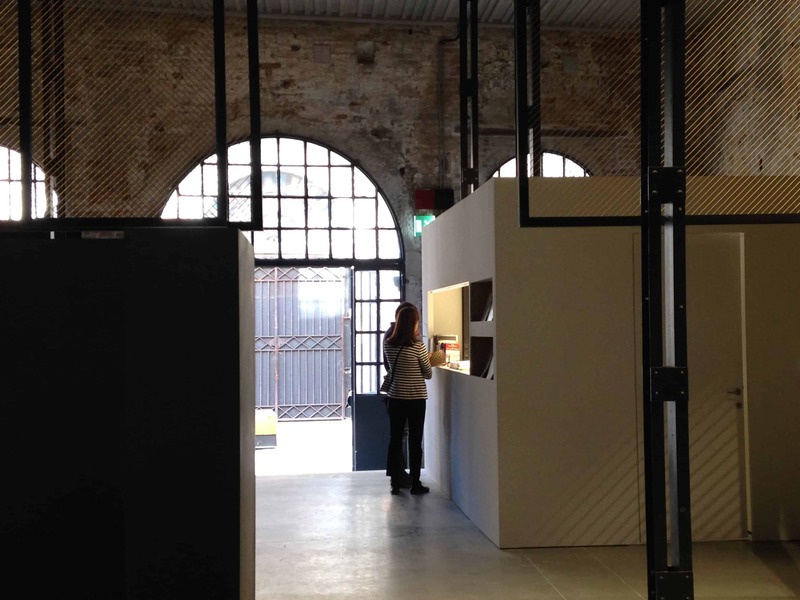 Architects showed their sensitivity to the existing structures in their surroundings by continuing the use of typical Venetian building materials, which might be more successful in some cases and not in others. Palazzo Venier dei Leoni is in Dorsoduro on the banks of Grand Canal; it is just located after the Ponte dell’Accademia, in front of Palazzo Corner, between the Basilica di Santa Maria della Salute and the Academy. 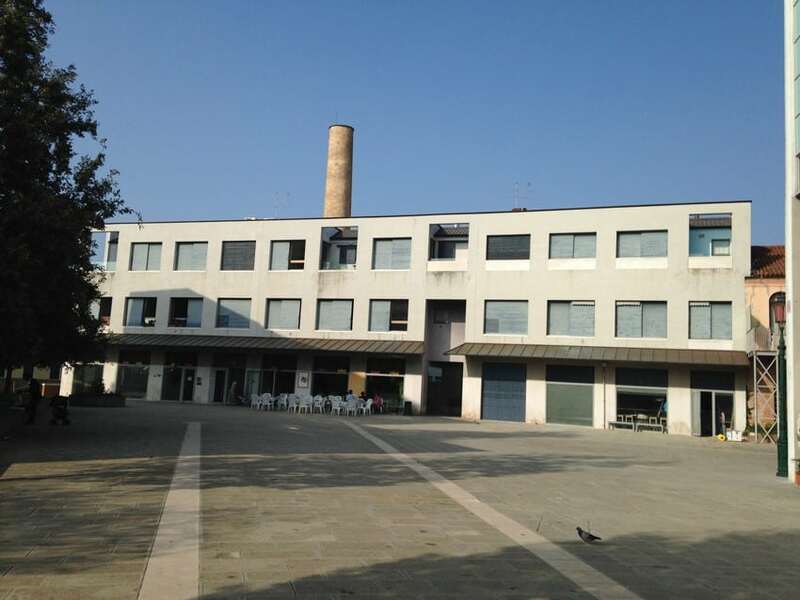 The building is not finished and it’s called by the Venetians “maifinìo” (trad. : mai finito, never finished): the incomplete palace. Begun in 1749 by the architect Lorenzo Boschetti (1709 – 1772), the construction of the palace stopped on the ground floorso that the long and low Istrian stone façade could form a caesura in the row of buildings that overlook the Grand Canal from the Academy to the Basilica della Salute. 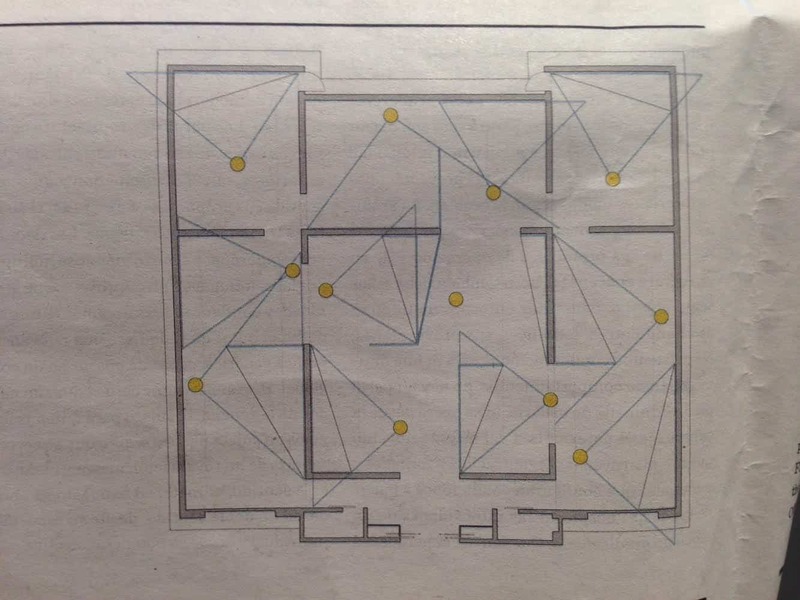 In his initial project Boschetti proposed to respect the Venetian tradition, distributing the rooms according to the customary pattern but varying the shape of the entrada, subdividing it in different areas. The façade on the Grand canal was built according to the traditional rules and would have to remember, especially in the upper floors, many well-known architectural patterns of another famous Venetian architect: Baldassare Longhena. The model also brings variants outside: windows on the ground and the mezzanine floor have a sinuous line, and in the second floor there are curved side windows topped by curved and triangular pediments. In the ambitious project of the building there is an entrance porch by land and a porch on the water, by the sea. At the entrance from the Fondamenta Venier there is a courtyard with steps that lead down into the channel and one of the largest gardens of Venice – element of utmost importance for its uniqueness while the entrance from the canal consists of a return preceded by a fence, opened on a wide terrace from where you can enjoy the view of the Grand Canal from Ponte dell’Accademia to the basin of San Marco. The result would be an important palace with a majestic and imposing size, but of unhappy proportions. Nobody knows the precise circumstances that led to the interruption of the construction of the Palace: some say that money began to fail, while other believe that the powerful family called the Corners, who lived in the building in front of Palazzo Venier, opposed the construction of a building that would surpass their own house in size and magnificence. The name of the building “Palazzo Venier dei leoni” hides some mystery too. Association with lions (leoni) in fact is unclear, and even here, popular legends mix with reality – and especially with the truth! – leaving space to the imagination. Some say that in the Palace garden was kept a lion in familiarity with some dogs (a very very special guardian, I would suggest!) while others take back to their fantasy and are content to a boring structural analysis: it is true obviously that the name may derive from the 18 heads of Istrian stone lion that decorate the façade-water level; we must also remember that San Marco’s lion is the emblem of Venice and it appears on the façades of several venetian palaces. After a glance at the building from its outside, which in its incompleteness still leaves people excited and breathless, it’s good to know that the most absolute wonder is kept inside, like a little gem, a carillon, which releases music by opening ever felt before and beyond compare: the Peggy Guggenheim Collection. 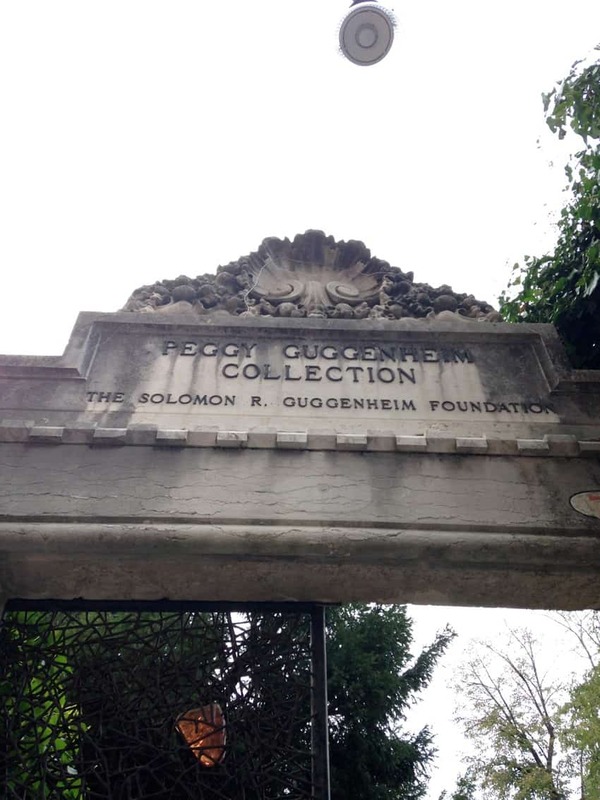 Internally, the Palace houses the Guggenheim Collectionwith paintings by artists such as Pablo Picasso, Vasilij Kandinsky, René Magritte, Jackson Pollock, and also the original bedroom furniture of Peggy Guggenheim. Peggy Guggenheim (1898 – 1979) began to take an interest in modern art in the 1930s and she bought her first paintings before the Second World War began. After this tumultuous period in Europe she went back to the United States. And after her marriage with Max Ernst, she opened the “Art of This Century” in New York City active from 1942 to 1947: Peggy would later play an essential role as intermediary in the development of the first American art. 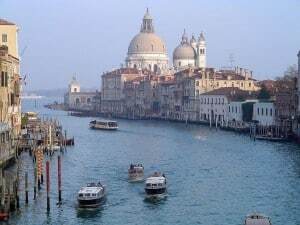 ̔̔It’s always assumed that Venice is the perfect city for a honeymoon, but it is a serious mistake. She spent 30 years in Venice, during which the aspirations and ambitions of her previous life found their highest expression. 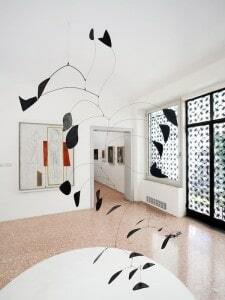 Peggy Guggenheim museum today is a great experience to live. Jackson Pollock is a young emerging artist when in 1939 Peggy decided to turn her simple London collection in a real Museum, the Guggenheim Jeune. Thanks to the Gallery of the Guggenheim, the unknown painter Pollock came in contact with the European avant-garde, particularly with Surrealism. I didn’t find anything about the relationship Peggy and Jackson were in, if they were close friendsor if she just appreciated his paintings. What I love about this building, however, is its candorand light. It seems like a place that has never changed during all these years, and I like the certainty that it will not change at all,like an ever-fixed mark that looks on the tempest and is never shaken. Another thing that I find beautiful as well as functional is the almost total absence of steps. And this is the result of transforming a House – a real home, where someone lived, cried, screamed, and laughed – at a Museum. It is ingenious, and bright. As I walk among the works and I expect to see the Museum furnished with the eccentric taste of pretty Peggy, with her strength, her mess. What a woman she was! Baldassarre Longhena (Venice 1596 – 1682) was an Italian architect and sculptor of the Republic of Venice. He was one of the most famous and representative artist of his time. 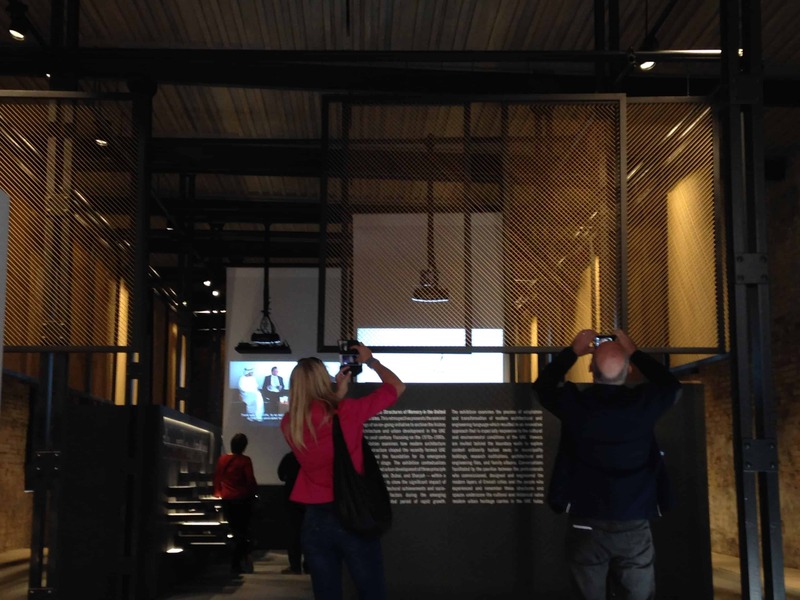 As Paolo Baratta, chairman of the La Biennale di Venezia, briefed interested visitors about 2014’s edition of this major event, he states the title “Absorbing Modernity 1914–2014” has been proposed as a title or common theme for the contribution of all the pavilions for the 14th International Architecture Exhibition. 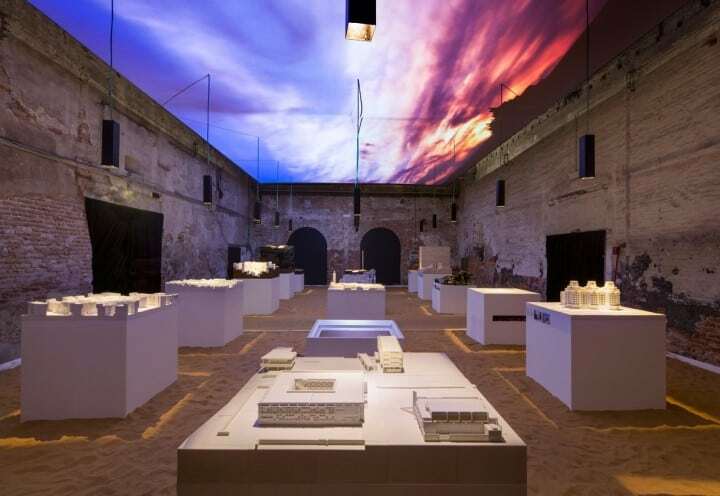 Rem Koolhas, director of this year’s Biennale elaborates by saying that the 65 participating countries – in the Giardini, at the Arsenale and elsewhere in the city – will examine key moments from a century of modernization (1914-2014), and they too shall contribute in part to the overall research project, titled as Fundamentals. Despite the installations being radically different in outcome, the homogenizing process of globalization appeared to be the one that ties the visuals together. 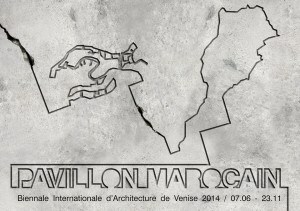 With that being said, I had a clear preference as to what would make a pavilion a successful one, and that would be a defined relationship of the national pavilion to its title and initial intention in addition to this year’s Biennale overall theme, and these terms were clearly portrayed in the Spanish pavilion. They say, “Leave the best for last” but that clearly was not the case when I first entered the Giardini. The Spanish pavilion is found at the main entrance of that particular sector of the city, my first encounter with this year’s national pavilions and my favorite thus far. 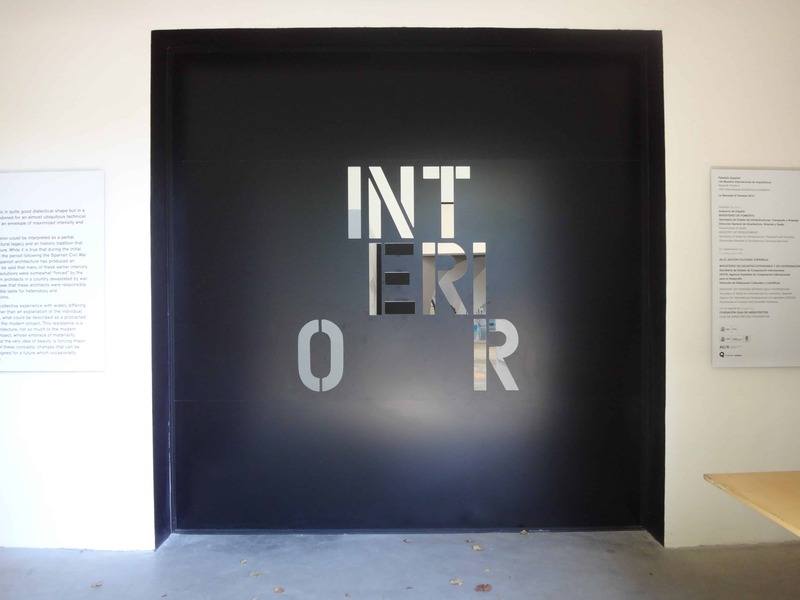 Titled “Interior” and curated by Inaki Ablos, Spain’s national pavilion forces visitors to direct their attention to the value of interior spaces and their relationship to the Spanish climate, culture, tradition and environmental related issues. It can also be viewed as an analysis of Spain’s 20th century traditions that date back to Roman and Arab traditions as well as defining the important traditional elements in Spanish architecture and narrowing them down to four, which are courtyards, shade houses and green houses, grottoes, and thermal baths. In theory, that is a direct link with Rem Koolhas’ general theme of Fundamentals but the Spanish pavilion team made it their own i.e. identifying their own version of fundamentals in Spanish architecture. 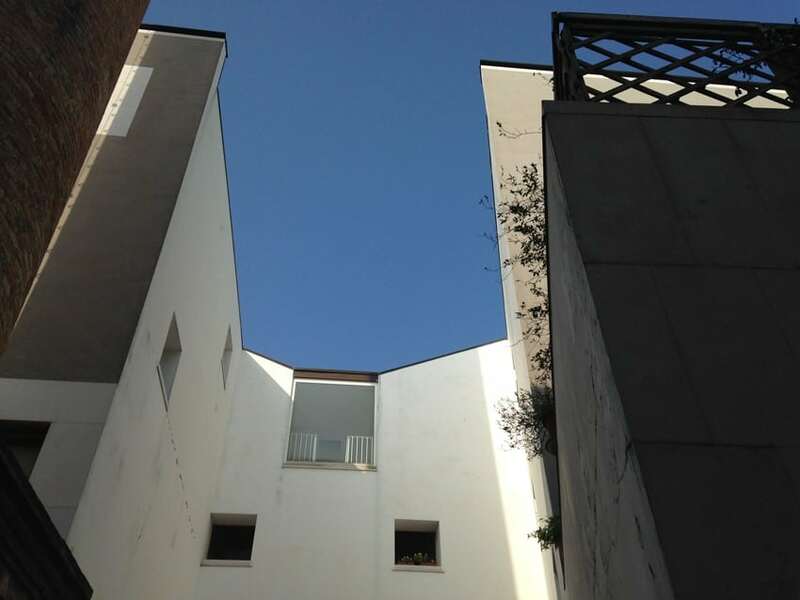 These four traditional elements are related to environmental factors and its awareness and they currently are a modern concern to Spanish architects. 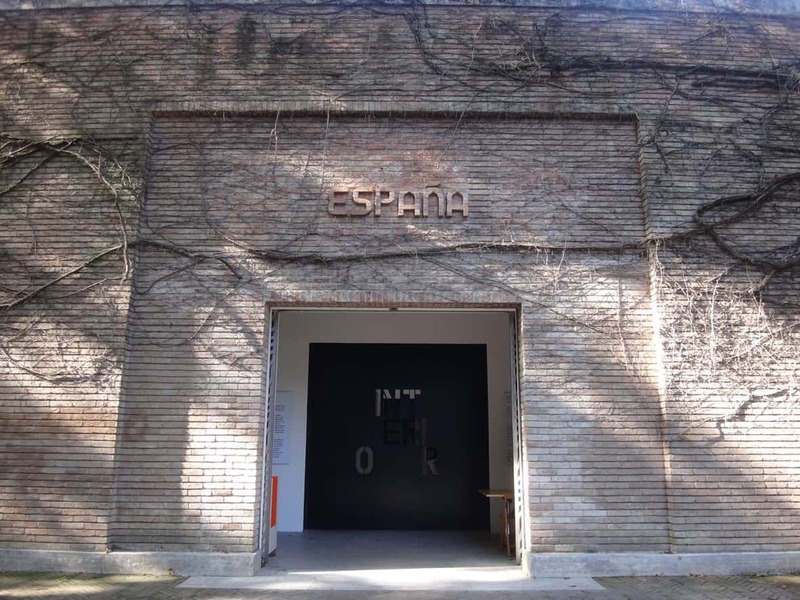 The 2014 Spanish pavilion at the Venice Biennale has successfully linked its main concept, displayed content and the Biennale’s adjoining themes (Fundamentals and Absorbing Modernity 1914-2014). The exhibition starts out with a brief explanation to the visitors about traditional architectural elements (courtyards, shade houses and green houses, grottoes, and thermal baths), which is considered an introduction or a threshold that prepares visitors for what is coming next. 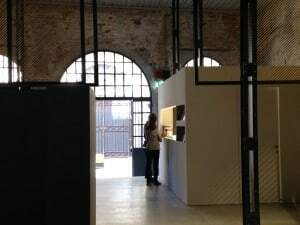 It gives visitors the underlying connections between the projects displayed as well as informing them of basic elements of Spanish architecture. 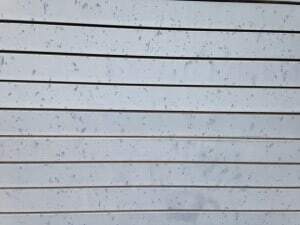 Nevertheless, choosing interiors specifically as opposed to architecture and exterior stresses on the roots of the rich Spanish heritage in that field specifically and that dates to the Roman and Arabic era. The exhibited spaces show how modernity and contemporary design are directly linked and are sensitive to their past, even if it was not clearly visible to the public. In addition, the constant reminder of environmental issues and influence is illustrated throughout the zones in the exhibition. Such concept led Spanish architects to create unique spaces instead of following modernity blindly and that is clearly visible in the selected displayed projects. Each of the projects has a unique feel as well as site-specific materials used and that is what identifies Spanish architecture form others. Last but not least; the Spanish pavilion highlights the fact that interiors are just as important as any other element in architecture. 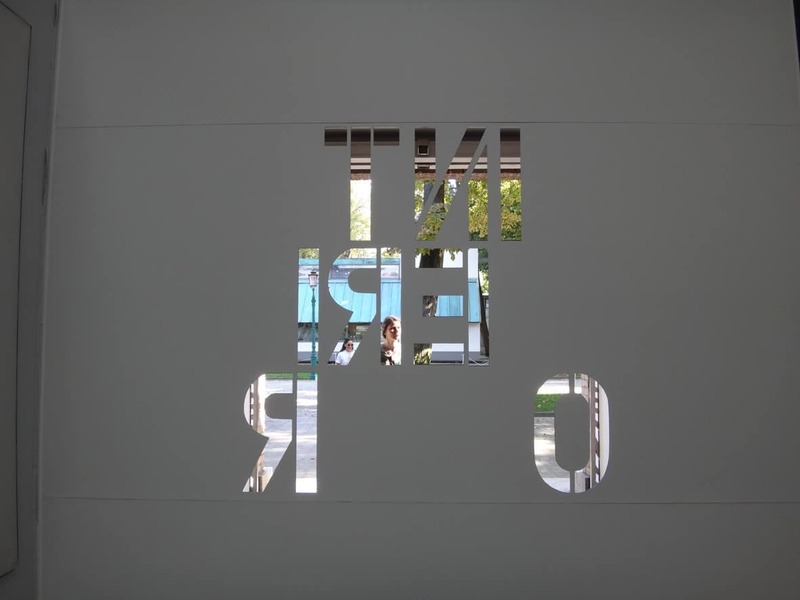 Even though the pavilion seems closed off from its surroundings at first glance, visitors then realize that the title of the exhibition itself gives you glimpses of how others are reacting to the displays inside as well as what to expect once you enter. Just like any other interior space, this subtle hint of an opening frames the adaptation of visitors to the interior space, which is usually a receptive and reactive one, and so showing hints of that adaptation is a key element that adds richness to the entire pavilion. In my opinion, the Spanish pavilion at the 2014 La Biennale di Venezia has created a successful composition that clearly communicates its concept and connects it with this year’s underlying theme of the exhibition. A clear concept is stated by explaining the four main elements of traditional Spanish architecture and is displayed in the zones of how it is influencing modern and contemporary architecture. As a result, it illustrates the importance of Interiors in Spanish architecture and ties it back to its traditional roots. These four main elements are considered the Fundamentals of Spanish architecture, which coincides with Rem Koolhas’ theme for the Biennale, while displaying them in a modern context relates to the pavilions’ concept of “Absorbing Modernity 1914–2014.” The Spanish pavilion, this year, uniquely created connections with the main themes as well as design an exceptional interior space that cannot be dismissed.